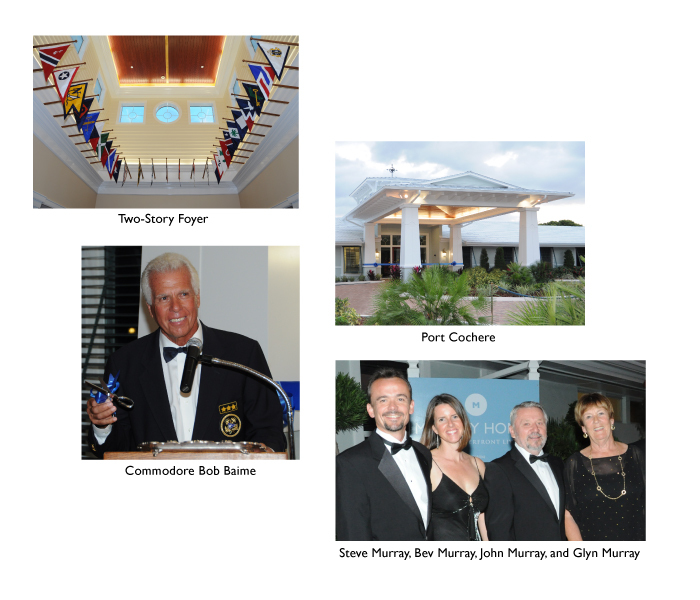 Bird Key Yacht Club Completes Renovations – Celebrations Start With A Bang! Murray Homes has just completed a major renovation of Bird Key Yacht Club. The project was completed on time and on budget and with outstanding results. Established in 1959, the Bird Key Yacht Club has seen numerous upgrades and renovations over the years. This project included renovations to the entrance, parking lot, a new, nautically themed entry hall and reception and lobby area with a grand two-story foyer and a new port cochère. A “Grand Opening” was held in conjunction with The Commodore’s Ball on Saturday, November 19th when Bird Key residents and club members descended in their finery to celebrate a ribbon cutting and a cannon salute followed by an exquisite dinner. Murray Homes was chosen from numerous applicants to bid for the project. Comments from Bird Key Yacht Club reflect a happy and successful outcome: “Working with Steve Murray and Murray Homes on this project couldn’t have made for a better renovation experience,” said Rob Edwards, General Manager “. He never lacked focus or momentum and doesn’t compromise. He wants to get it right; that’s the way he operates! John and Glyn Murray have been members of Bird Key Yacht Club since 1995 and the family actively races there. The combined expertise of Murray Homes and Murray Realty makes that “impossible dream” not so impossible! Whether it’s building your own stylish home, or building to sell, we can deliver. We can take it from the ground up – find the land, design and build your personal luxury waterfront home – or we can take an existing home and give it an extreme makeover like no other you’ve ever seen. Our meticulous approach to building and understanding of this area’s real estate market came into play again as we recently completed and sold two multi-million dollar homes on Bird Key. Who says there’s no way to get what you really want out of life in today’s economy? Whether you are a buyer or seller, the Murray team offers you unparalled quality service in all aspects of your real estate venture. Let us help you make that impossible dream a reality. Call us today. SARASOTA MARKET IS HOT, HOT, HOT! According to the Sarasota Association of Realtors, this community is one hot commodity! Single family home prices have hit the highest level since June 2010 and the available inventory of properties has dropped to the lowest level in more than a decade. So what does that mean for you? It’s time to jump into the market! With prices for both single family homes and condos above the annual median prices for the past two years, it’s obvious that Sarasota is a destination for people on the move. Forbes Magazine recently named Sarasota a recession proof city! With a solid median home price of $143,000 and price increases for the first two quarters of the year, we’re looking pretty good!